As of 2014 over 89 schools and 5,300 students have engaged with our Schools Outreach Programme! 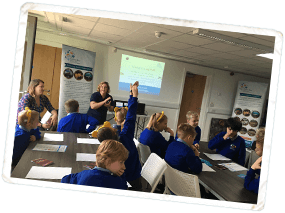 The Lyme Bay Schools Outreach Programme established in 2014 works with fishing ambassadors to engage young people and local communities with the marine environment and work being done to protect it in Lyme Bay. The Programme has raised awareness among the local communities and wider public of the benefit of conserving the marine environment – not just for the sake of conservation but so that the healthy marine environment can be enjoyed by all and provide a sustainable economic contribution towards the local economy. These sessions are designed to equip students with an understanding of basic marine ecology and how fishing sustainably in Lyme Bay can protect marine species and habitats for future generations. Delivered at your school by experts for FREE! Brought to you by the Lyme Bay Fisheries and Conservation Reserve – a project facilitated by the Blue Marine Foundation and funded by Marks and Spencer.